This was very tasty and quite easy to make. There will be left overs so cook the pasta separately and add to the soup as needed. Nice creamy texture that is just thick enough after you mash the potatoes (great idea), with just a lovely rosemary hit at the end. Great for dinner with the proposed croutons. Very nice and hearty soup. I went with one very large ham hock that was about 2 lbs and it was just right. Used puy lentils, which made for a lovely texture, but I did have to blitz them a little with an immersion blender. I also added a bit more thyme than suggested. Very good, hearty soup that works very well for dinner with a crusty break roll. Pg. 78 There were a few flaws with this recipe. Firstly if you add the garlic and cook it over medium high heat for 15 minutes it will burn. I ended up having to fish it all back out, it would make more sense to simply mince it and add it with the spices so it cooks just a little before the liquid goes in. With regards to the liquid I put about 3.5 cups and this was plenty, the recipe calls for 6 cups, which to me seemed far too much. Finally, the predominant flavour is cumin, which I like, but why bother with the rest of the effort if all you taste is cumin. Pg. 96 This was very reminiscent of Manhattan clam chowder, which was a good thing for us. The bacon was lovely, especially since the cod is very light in flavour. I like my potatoes a little bigger so I cooked for about 4 minutes. Also, I went with about 1.5 lbs of fish and that was plenty. Pg. 102 This came together in just over 30 minutes and was very tasty. Nice cold weather stew with lots of leeks, a touch of acid from the lemon juice, and beautifully cooked shrimp that were just right after about 3 minutes. Delicious and easy. I went with about 75% of the suggested butter. I went with 5 large mild sausages and that was good for 4 people. The overall flavours were nice with relatively flavourful braised cabbage that benefits from the flavour of the sausage and the fennel. it was also very easy to put together. I did go with about 5 cups of liquid instead of the 8 as I was aiming for more of a braise. I would also go with a full tsp of fennel next time. Pg. 118 I loved this. The significant other was expecting something latin when I said it was Cuban but this dish reminds me of southern comfort food. Reminiscent of pulled pork, the stew is a saucy blend of shredded meat and looked cooked veggies. The addition of tomatoes and tabasco makes more a nice tang with just a hint of warmth, delicious? It is a bit of a set it and forget it dish as you need quite a bit of time to cook the beef till it is fall apart tender, but there is relatively little active time. Served over rice. Not a winner for us. The sauce never really thickens so you end up with a watery sauce that doesn't cling to the shrimp at all. A thicker sauce might work but not sure it is worth the effort. The flavor is nice but the recipe needs some fiddling with. Given the amount of liquid you end up with soggy skin after the braising. Also the sauce is fairly clear. I'd suggest browsing to render fat and then discarding if skin. Also I'd thichen the sauce with beurre manié or cornstarch. I also lcjecrhe chicken after cooking sad then put Gavin into the sauce. I'd even consider adding a touch if cream to the sauce. Tom Valenti is Manhattan's grandmaster of comfort food, a much-touted chef who has made this beloved cooking his hallmark. And on any given night, you'll find him at his wildly successful Upper West Side restaurant Ouest, cooking hearty soups and chowders, casseroles, chili, stews, and slowly braised, cut-with-a-spoon tender meats, for the likes of Bill Clinton, Steven Spielberg, Charlie Rose, and Barbara Walters. 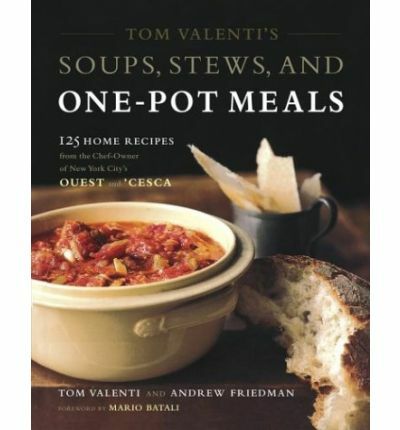 In Tom Valenti's Soups, Stews, & One-Pot Meals, Valenti and co-author Andrew Friedman dish up the flavor that we've come to expect from a celebrated New York chef, without any of the fuss. Here are realistic recipes for the home cook--most made in a single vessel--all based on the fact that the right ingredients, left alone cooking in one pot with virtually no intervention from the cook, will steadily build glorious flavor. This is make-ahead food that gets better a day or two later, this is dinner party food, holiday food, food that's made on the weekend and savored throughout a busy week. Beautifully designed with 16 pages of color photography, the book includes more than 125 recipes for delicious, deeply satisfying meals including Tomato, Bread, and Parmesan Soup; Creamy Smoked Cod Chowder; Lentil and Garlic Sausage Stew; Lobser Shepherd's Pie; Texas-Style Chili; and meltingly tender meats, such as Florentine Pot Roast with Red Wine, Mushrooms, and Tomatoes and Slow-Cooked Chicken in a Pot.